Do you like the back of the dress?? On Sunday the familia headed off to Catalina Island. We had to wake up super early and drive to Long Beach to take the Catalina Express to Avalon. The boat ride was super fun and FREEZING. If you're EVER to take a boat in the morning don't sit outside in the back, you WILL freeze. Take it from Popsicle me. Also, it will beyond ruin your hair. I ended up fish-tail braiding it once we got to the island. You can't really tell in the pics because A. most are not up close and or dark B. brown hair just does not photograph well! The island is full of fun beachy and adventurous things to do... swimming, jet skiing, para-sailing, zip-lining, kayaking and other things that I can't seem to remember. 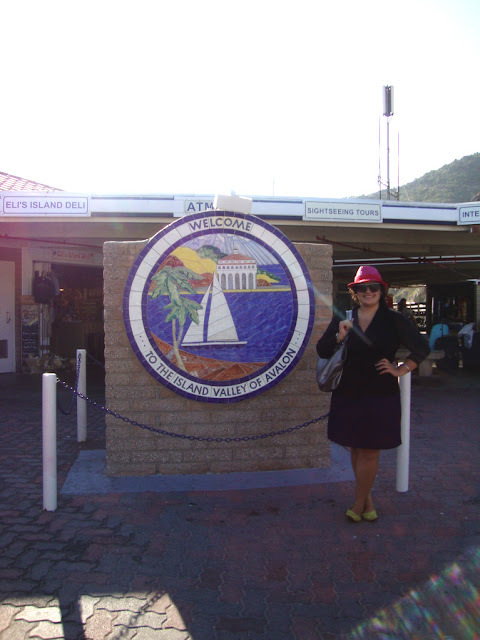 Unfortunately I didn't get to try any of the "adventurous" things and stuck with walking on the beach, tanning (YEAY farmer's tan), discovering the island and shopping! Ou one of the cutest things about this island is that there are (almost) no cars. Everyone drives around in a golf cart. They even have "Student Driver" golf carts!!! I'm supposed to be pointing at the boat gas station (on the right) but eh.. 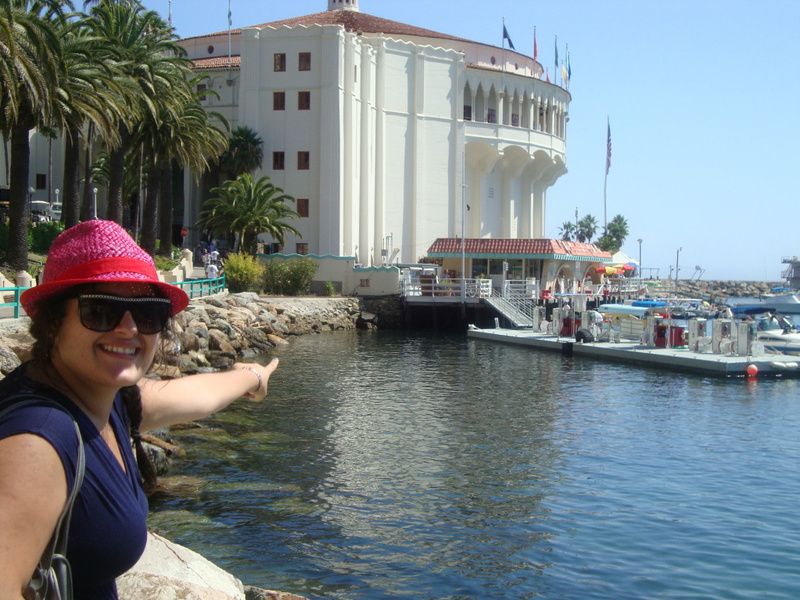 I ended up pointing at the theater/museum/cafe building. Hope you guys had a fun weekend! 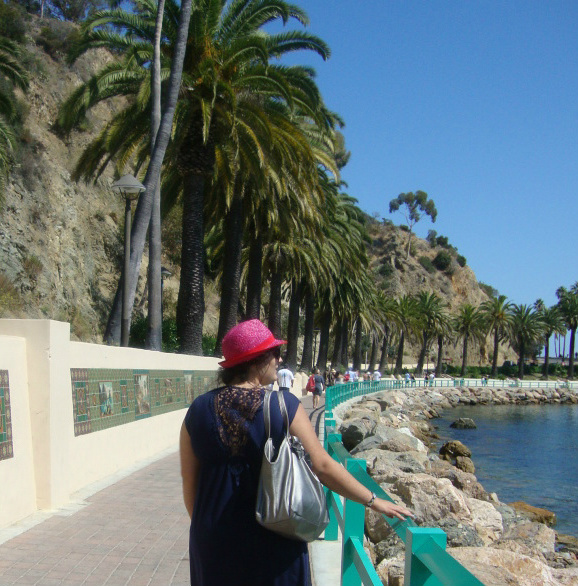 I love Catalina Island it is so beautiful! Last time I went there by boat I did the same thing..rode in back and froze to death ahhhhhh!!! I love the cute fedora and so glad you finally found one! Love the lace on the back of the dress. Seems like a pretty place too! The back of the dress is very pretty! I like the pink and red fedora too. great pictures and nice hat! chech me out.